When I first considered raising backyard chickens, I was concerned about what it would take to get started. Sure, the chicks themselves were inexpensive, but what weren’t my friends telling me? I knew how the story goes with other domestic animals: my black lab was practically free compared to all of the shoes she ate as a puppy, the limited ingredient food she now eats, and the vet appointments it took to get an allergy diagnosed – not to mention the time we spend picking up after her in the backyard. Yet, I still love her dearly. There was space in my heart for a backyard chicken flock, too, but was there space in my day, and space in my wallet, and space on my property? My Murdoch’s rep was very helpful. She had chickens of her own, and she explained that initially, all you have to do is keep them warm, watered and fed. With a few chicks, a waterer, a feeder, pine shavings, a heat lamp, and some starter feed, I sanitized a plastic dog kennel and housed the chicks in my basement until the mountain spring weather turned from freezing rain to sunny days. Everything was going great! My chicks turned from fluffy puff-balls into ugly teenagers, and I moved them to an outdoor shed. I inherited a used coop that was essentially a framed box covered with chicken wire. Inside of it, I repurposed an old kitchen cabinet for the nesting area. And that, my friends, was a mistake. 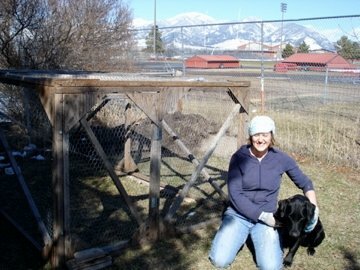 A proud pose next to my freshly re-built, hand-me-down coop and canine partner-in-crime. Compared to Purina’s chicken coops at their research farm (pictured above) you can see why my rickety coop just didn’t get the job done right. – It’s not pretty, but it’s definitely do-able to start out with a retro-fitted environment. That said, you have to transition into a permanent coop, or you won’t keep it clean. – Electricity and quick access to water are essential. I didn’t locate my coop in the right place on my property. – Lock the gate. Sadly, chickens will cross the road without giving you a reason why. Yes, we had a runaway. Before I could fix my makeshift coop, I moved to a new property that had a no-chickens covenant. I had to find a new home for my flock. In hindsight, I didn’t commit to my birds the way an owner needs to. I was concerned about what it would take to get started instead of being concerned about what it would take to maintain a backyard flock. Lesson learned for next time: buy the coop! Here’s a great article from One Acre Farm about the Pros and Cons of Backyard Chickens. I wish this had been posted before my failed attempt. Here are a few good chicken coop options from Murdoch’s. next Life is Short. Bark Loud?